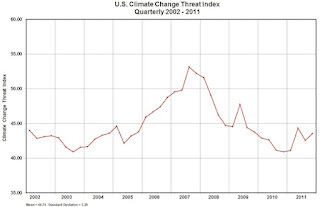 Climate Code Red: Is all “good news” and no “bad news” a good strategy? And there is an interesting question about why energy efficiency, the “lowest-hanging fruit” of all the available emissions-reduction strategies, rarely rates in the “good news”. Perhaps it is not an “easy” issue on which to campaign? And a one-sided emphasis on renewables has some other dangers. It can construct the debate as just being about supply-side options, an emphasis that pushes demand issues – and Australia’s responsibility as a very higher per capita emitter and user of energy – to one side. Global equity is central to global action, and it could go two ways: everyone in the world increases electricity consumption (whatever the source) to our level, or our level goes down rapidly towards the global average. In fact, the quickest demand-side option would be to stop the outrageous deals to flog large amounts of energy to the aluminium smelters at implied subsidies subsidies comparable to their wages’ bills. And the idea that “bad news” about the world – wars, poverty, inequality – cannot work, when linked to positives outcomes or visions and choices, is absurd. Stopping bad things happening can be a great motivator. If you believe only “good news” works, it’s hard to explain the success of the anti-coal-seam-gas "Lock the gate" campaign, or the enthusiasm for blockading a coal port, or of the popular appeal of campaigns past and present to stop wars, end Apartheid, and so many more “oppositional” struggles. 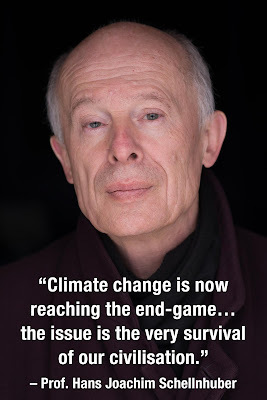 Peter Lewis of Essential Media says if you wish to mobilise public opinion, then "focus on the science first, second and third – and then start talking about the impact on our carbon-exposed economy if we wait for the rest of the world to act first". Making the science/impacts part of the narrative seems essential, in light of consistent polling (for example here) that finds only half of Australians say that “Climate change is happening AND is caused by human activity”. Research studies find that media coverage of climate change directly affects public concern levels, and that the actions of political elites turn out to be the most powerful driver of public concern. 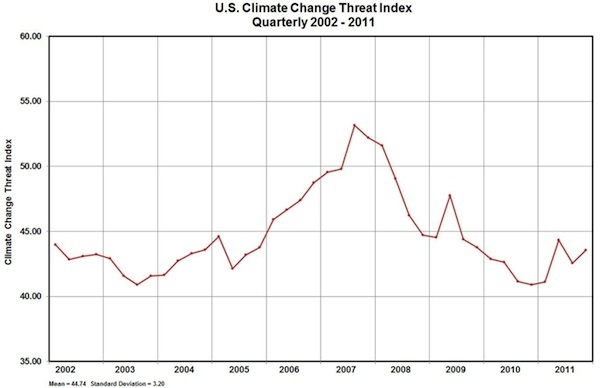 Concern in the USA was at is height around 2007, at the time of media focus on the IPCC’s fourth assessment reports and Al Gore’s “The Inconvenient Truth”. As partisan and ideological divides kicked in, concern fell. The research concludes that “public communications (by political elites) must continue to support climate change against opposing messaging campaigns… with amplified political mobilization”. In this context the failure of the Rudd government after December 2009, and of the Gillard government, to drive the story of climate impacts in the public arena is a disaster. Despite the deniers’ assault in the US, public understanding of climate is now on the rebound, with Americans attributing their increased belief in global warming to their (correct) perception that the planet is warming and the weather is getting more extreme. 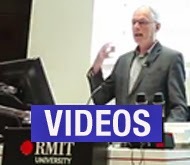 It is astounding that neither the prime minister or any leader of either major party anywhere in Australia can say in public what most US citizens already know: that global warming is making high-profile extreme weather events worse. 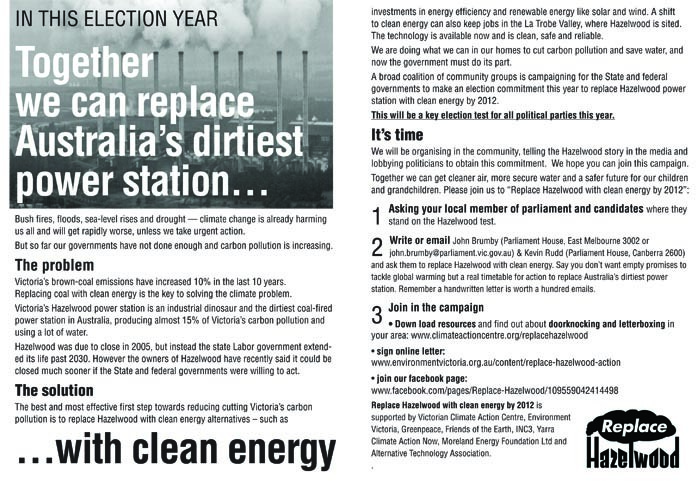 Resulted in Playford becoming the focus of a big solar campaign, but only because a close-down-coal campaign was successful! 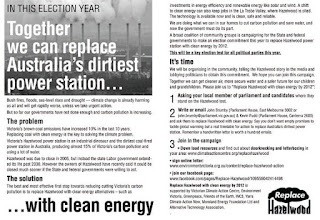 A one-sided emphasis on telling the good news means that one half of the narrative, as used in the Hazelwood campaign – of replacing fossil fuel with clean energy – gets lost. Coal and gas drop out of sight, and that’s not surprising coming from the federal government, which is overseeing a massive expansion of both industries. But as Greenpeace has again shown recently with the launch of its new Queensland-focussed campaign, coal is where the political heat really rises. There is an element of truth in what Paul Keating recently told Philip Adams on “Late Night Live”: if you’re not creating enemies, you’re probably not achieving anything in politics. The strategic question between renewables-only messaging and other choices has become more urgent with the growing evidence that the Gillard government has trashed itself beyond all help, and that a victory by the delay-and-deny Abbott-led opposition looks very likely. In a recent exchange, one NGO climate campaigner asked: “Does it really make sense for most of the movement to be working on the Clean Energy Finance Corp when its chances of surviving may be slim?”, and another responded that their “only concern with a singular focus on renewables is the Coalition can say we are supporting renewables through retaining the Renewable Energy Target and then get rid of everything else (including supporting the 5-25% range)… it is a danger for us”. They had been working the wrong problem, focusing on renewable energy instead of the broader climate picture. "What does it mean that we celebrate the construction of a $100 million wind farm in Minnesota when at the same time a 900-megawatt coal plant was being built?" asks Noble. "That's called losing. If you looked at the problem through the lens of carbon, all the work we had done was undone by a single plant­—a plant that wasn't challenged by a single environmentalist. There is no argument that Australia must move to renewable energy at a pace quicker than is generally understood, but it also true that the emissions created by the expansion of Australian coal exports will dwarf all the emissions saved by closing down the domestic fossil-fuel-energy industry. 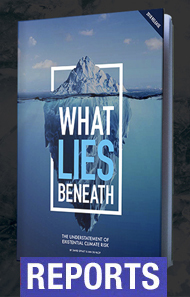 The carbon price, on which the “Clean Energy Future” marketing and the Say Yes campaign have dwelt, is no obstacle to the deadly expansion of Australian coal and gas industries. As "The Sydney Morning Herald" politely noted: “the extraordinary continuing growth in demand for coal for electricity and steel production in Asia challenges Prime Minister Julia Gillard's assertion the world is moving to cut greenhouse gas emissions”. The new mines of the relatively small Jellinbah Coal add nearly 100 times as much CO2 as is saved by all the household solar panel installations in Australia. So the question of strategic focus is no small matter. Next blog (the fourth in this 5-part series) will ask: What are the consequences of failure?